Born in San Francisco, Jim Goar has lived in Tucson, Arizona; Changsha, China; Boulder, Colorado; Bangkok, Thailand; Seoul, South Korea; Norwich, England; and, whenever possible, Brevard, North Carolina. 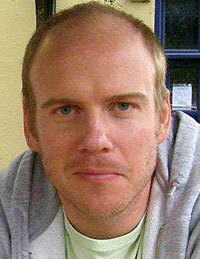 He received an MFA from Naropa University and a PhD from the University of East Anglia. In 2010, Reality Street brought out his first full-length collection, Seoul Bus Poems. 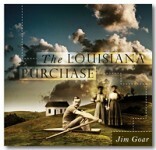 The Louisiana Purchase (Rose Metal Press) was published in 2011. Goar adjuncts at the University of South Carolina. Monkeybicycle: From the author’s note: “Assembled from fractured myths, Westerns, Disney, fictions, childhood memories, life abroad, and primary sources, what follows is my uneven, transitioning, and forever incomplete America. The Louisiana Purchase, an attempt to locate what I contain, is both the expedition as well as its report.” Where did this project start, and what was its impetus? Jim Goar: The Louisiana Purchase began in 2002 while I was at Naropa. I was having difficulty justifying line-breaks and so wanted to write without them; Jacob, Saramago and Michaux were always open, and, before I knew it, I was writing these connected pieces. This series, first published as the chapbook Whole Milk (effing press, 2006), became the middle section of The Louisiana Purchase. Mb: How often is the historical or geographical a focal point of your writing? JG: The Louisiana Purchase began in Boulder, continued in Bangkok, and finished up in Seoul. It had to do with the land, but more a personal myth making. It needed the thought of the United States of America, but it did not need to occur there; the majority of the material had already been gathered. The pieces were written when this material aligned with the location of the writing. By the time Seoul Bus Poems began, I wanted to further interact with where I was. So, instead of recasting myths and memories, this writing functioned as a way for me to sit with myself and my language in a moment of radical change. Mb: From the opening section, “1806”: “Mrs. Jefferson is carrying a torch for the moon to see. The President attempts to extinguish her flame. Martha tells him to sleep on the couch. He tells her he will, but that night he sleeps under the stars instead.” Why pay so much attention to the vast and unending sky in a poetic set concentrated on the literal mapping of physical, earthly territory? JG: The moon is a trickster. The moon complicates. The moon never leaves earth or us alone (see tides and madness and werewolves). It is a force in the mind of the explorer as well as a body that alters the land. Mb: Though much of The Louisiana Purchase is quirky and fun, filling its stanzas with witticism and beauty, the closing section “The Northwest Passage” quickly shifts the book into a somber and contemplative place. Does this a mirror your view on the ultimate end result of the Louisiana Purchase as a historical moment? JG: The final section of the book was written while I was living in Bangkok during the ‘peak’ of ‘Bird Flu’. The question of ending began. At some point you hit the Pacific and the expedition must return east. The mythical land, then, has already been walked and turned. It is not so much a failure as a necessary decline. I felt the descent very acutely during this time. Mb: You’ve lived in a wealth of cities both in the U.S. and abroad, but how many areas referenced in The Louisiana Purchase have you actually lived in or visited? JG: I think this question and the next are more interesting than my initial answer. There is an easy response: I’ve lived here and here and visited here etc. However, what does the truth of this matter? I think the follow-ups, concerning appropriation and exoticism, are more interesting. Purchase a copy of The Louisiana Purchase here, & read more from / about Jim Goar here.